The Capilano river levels play a huge effect on the beach fishing scenario.The river has been really low for a while so we will have to see if this rain is going to rise the river level or not, however the tides are not in our favor to fish off the beach until Thursday when the tide goes lower than 6 feet again. If you are fishing terminal tackle you can always fish off the jetty or fish off a boat in the bay. Also the full moon will help the coho navigate themselves to there native river so expect to see the numbers of salmon increase after this moon cycle. The biggest tip I can give you is to change your fly every few casts as you cast to a pod of fish, fishing the same fly and getting refused is not productive so it is important to have a variety of patterns in you fly box. There is no such thing as the “BEST FLY” or my favourite fly, the only way to know which fly worked that day or in that second is when you have a coho ripping line off your reel. Also it is important to fish the fly pattern that you have on correctly and not just strip at one speed. It is fun and reading to figure all this stuff out on your own but if you don’t have time nor the desire to do this then I highly advise to take the ‘Fly fishing on beaches course that we offer. Beach fishing for salmon is slowly ramping up you can expect to find numerous coho and the odd Chinook off of Ambleside beach over the next coming months. One way of targeting these fish is with spinners, spoons, and buzz bombs. Gibbs Crocs, Blue Fox Vibrax spinners, and 2″ Buzz bombs in a variety of colours are your weapons of choice. Unweighted spinners such as Colorado or French blades can be quite deadly as they have less profile in the water and when the fish are picky they clean house. Fish them with a enough weight to cast and a 2 to 4 foot leader. Pencel lead, egg weights and spitshot are the weights of choice. Rods 8’6″ to 10’6″ in length paired with either a levelwind or spinning reel are recommended. For mainline you can use Trilene XL in 12 or 14lb as well as Stren 14lb if you prefer monofilament. Braid is another option. 20-30lb PowerPro Super Slick is a nice line for bombing long casts and having direct connection to your spoon or spinner so that you can feel the softest of bites. For leader line you want to be using 10 to 15lb fluorocarbon, and shifting to heavier line if you are targeting Chinooks later in the year. Since it is a clear water fishery the coho off Ambleside can be very spooky. The use of fluorocarbon can be the difference between catching fish or not. This fishery is very tidal dependent so you want to be fishing off Ambleside on a low slack tide ideally. You can expect fish off the beach first thing in the morning on ebb tides as they will hang out close to shore due to the low lighting. Flood tides are typically not the best tides as fish have lots of water to move around and they typically hold out of casting range but the odd one does get caught. It’s been a slow start to the season but things will pick up quickly as long as the Capilano stays low. The odd fish has been caught but it will only get better as more fish stage off of Ambleside. Well it looks like we are in for a wet one for the next 3-5 days. I am currently at home treating my rain gear to make sure it is nice and waterproof, as I will be guiding the next 3 days on 10-hour trips. That can make for a soggy day if you aren’t properly prepared! With all the rain in the forecast, hopefully the Capilano River doesn’t come up too much, as so far this year the river has been getting all the fish and the fishing off West Van for the trollers hasn’t really kicked into high gear. There have been a few caught by trolling flashers with white hootchies from Point Atkinson to the Cap Mouth, but it has been far from on fire. There have been a few fish caught off the mouth by anglers using spinners as well. We do expect things to pick up this coming week, so stay tuned. 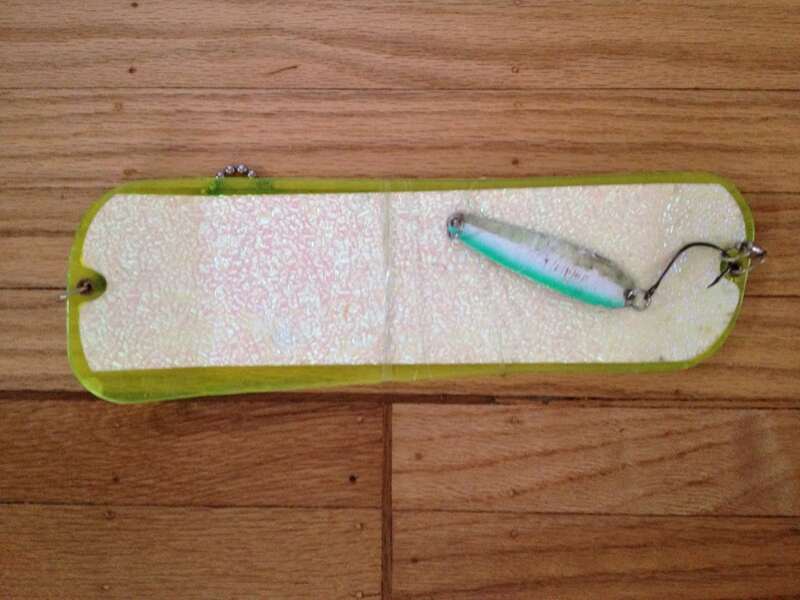 If you are looking for a go to setup for this coho fishery a Purple Onion flasher and a white or white UV hootchie with a 28-inch leader is a great place to start. Try fishing the upper part of the water column as well, from just under the surface to as low as 40 feet. 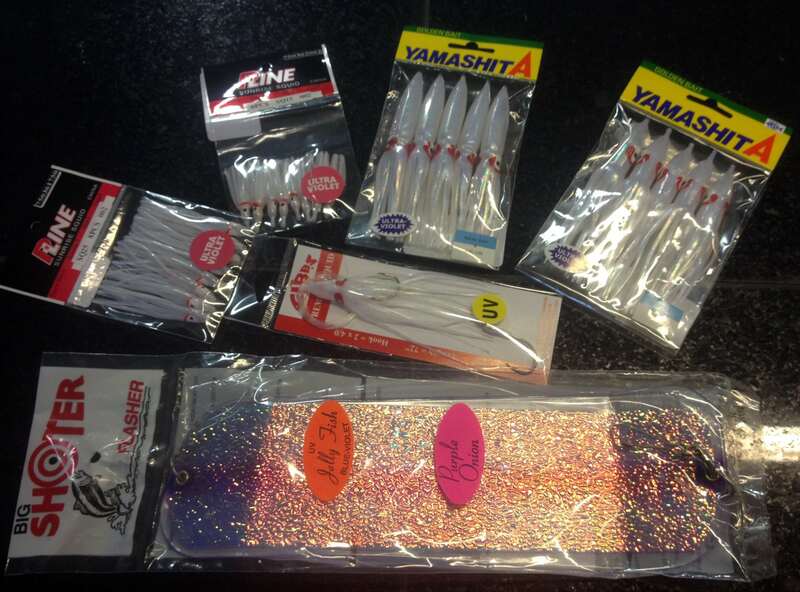 We’re fully stocked in the shop with guide favourites Purple Onion flashers and a full selection of white hootchies. A reminder that there is no retention of chinook salmon in the following areas as per a DFO email we received today. Effective dates: Immediately until July 31, 2016. Waters: Subareas 29-6, 29-7, 29-9 and 29-10 (Fraser River mouth). Management measure: You may not retain Chinook salmon in these waters. This management measure is in place to protect early and summer run, interior chinook salmon. This has been the case for the last number of years now, so nothing new. We expect these areas to open up August 1st. In the mean time you can still retain chinook around the Bell Buoy and there have been some nice fish taken there this week. 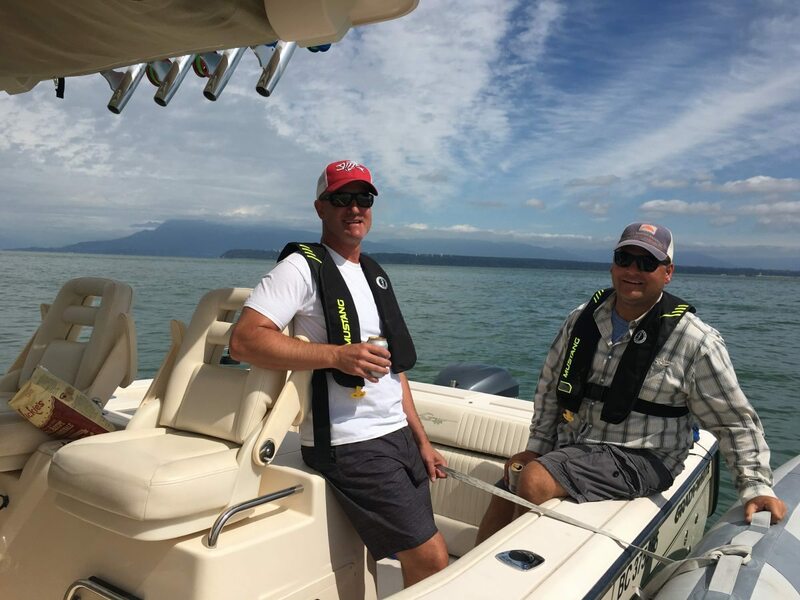 Try fishing in 90-140 feet of water and 30-75 on the downriggers. Top flasher choices are Salty Dawg, Green Onion Glow, Chartreuse Glow. For lures, the name of the game is bait. Herring or anchovy in a glow green or glow green and chartreuse teaser head is the way to go. Use a 5 to 6 foot leader from your flasher to your bait. This fishery is just getting going and will be hit and miss for a while but will consistently improve as the month goes on and more Fraser chinook enter our area. There are still a few fish getting caught over at Thrasher but with the big SE winds and big seas, they have been pretty safe from our efforts the last few days and that might be the case this weekend as well. A teeth beaten Pesca spoon + O’Ki Flasher, Guide Eddie’s top producing setup for over a season was a casualty to tough fishing in the SE winds this week. Another option is Hole in the Wall. Usually right about now we head to this area and catch some of the chinook heading up Howe Sound on their way to the Squamish River. Much like the Bell Buoy fishery for Fraser chinook, bait is the go to. Fish the same flasher and bait setups and fish from 50-120 on the riggers. Early in the morning on wet and dark days the fish are shallower and deeper on the hot, sunny days. Doesn’t look like we will have to worry about that this weekend! As if there weren’t enough spots to fish, there are still a few fish getting caught off Cowans and Roger Curtis. Nothing like the action of a few weeks back, but there have been some chinook and coho taken there this past week. So as you can see, there are lots of spots to hit this time of year. July is full of good options. I think where we head out on our trips the next few days will likely be dependent on the wind. Either way, we have lots of options for chinook and coho so if you are thinking of booking a trip now is a great time. If you have your own boat, come on down to the shop for some expert advice and all the right gear. Please note that the phone has been ringing off the hook and emails have been pouring in. Many days we are already fully booked. Please give us a call earlier than later if you are planning on heading out on a guided trip this year so we can make sure we get you out on your desired date.